As Coal Jobs Decline, Solar Sector Shines The loss of jobs has stung as the coal industry has declined. Renewable power — especially solar — is now where the jobs are. Solar jobs outnumber those in coal, but coal jobs pay more. 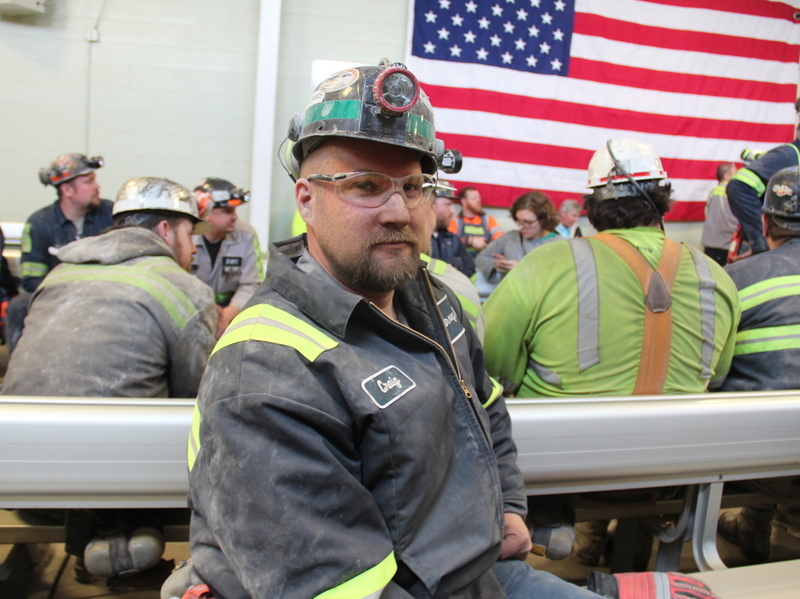 Coal miner Craig Williams waits on a break from his job at Consol Energy's Harvey Mine, in Sycamore, Pa. "We're one of the last industries around and hope to keep it that way," he says. "If you had to take another job, in this area especially," Williams says, "you're going to take anywhere from a 50 to 70 percent pay cut to what the next best thing is that's out there." That's a reality more miners face, as coal jobs have shrunk by 40 percent since 2011. What is growing is the number of jobs in renewables. Solar power accounts for just under 1.5 percent of electricity in the U.S., and yet, according to the Department of Energy, there are more than twice as many jobs in solar as in coal. It's tempting to ask: Can't laid-off miners just switch to solar? "Well, certainly it's a possibility, but there are a couple major challenges," says Rob Godby, an energy economist at the University of Wyoming. One of those is simple: location. "When you are thinking about coal mining in Appalachia," he says, "often times there are generations of families in those regions, and it's just very difficult to pick up and move." The other big hurdle is pay. If coal miners average about $35 an hour, for renewables it's more like $20 or $25. "That doesn't mean you couldn't raise a family on that," Godby says. "But you're a lot closer to the average income in a lot of states in the solar industry than you are in mining industries." 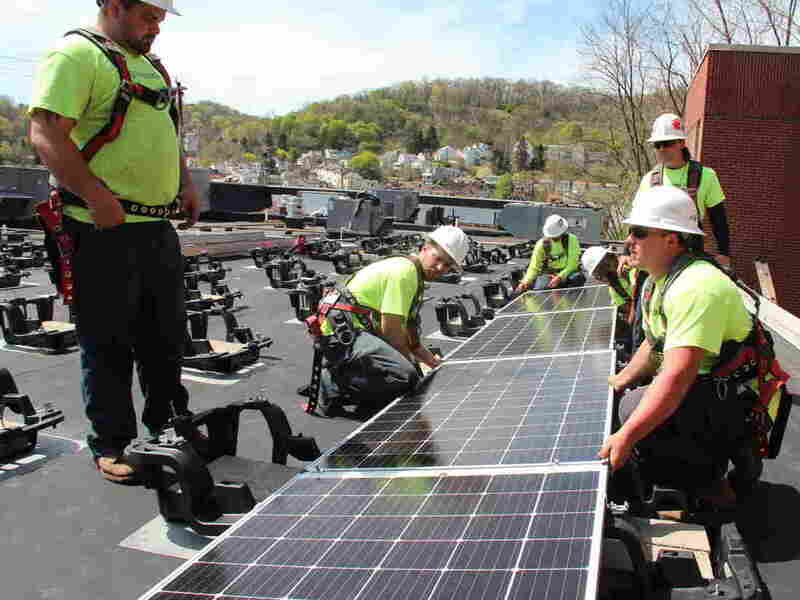 A work crew for the Pittsburgh company Energy Independent Solutions installs solar panels at a community building in Millvale, Pa.
On a rooftop at a community center near Pittsburgh, Brian Krenzelak and six other workers in neon green T-shirts bolt down solar panels. Krenzelak was a roofer before joining this company, Energy Independent Solutions, 7 1/2 years ago. In addition to installation, he also helps train workers. Krenzelak says he believes in the mission of solar, and it's a good living. His wife also works, and the couple have three kids, one in college, with another about to enter. "I do well with this company — very well. It covers what we need to cover," Krenzelak says. "I'm not becoming a millionaire overnight, but steadily have been building the nest egg, for sure." Energy experts say solar's surge is being helped by incentives that are scheduled to run out in a few years, and they don't know how long the boom will last. Still, economist Godby says solar is here to stay, "and it will be hard to automate the construction jobs and many other tasks involved in solar power provision." For now, Krenzelak's company is so busy it's looking to roughly double its workforce of 22. "We had to slow the salesmen down at a certain point," says Krenzelak, so the installers could catch up. He says it feels good to be in an industry with a future. Reid Frazier is a reporter for The Allegheny Front, a public radio program based in Pittsburgh that covers the environment. You can follow him @reidfrazier.